It’s a weird time for the Defenders universe. With Iron Fist, Luke Cage, and Daredevil rather unceremoniously canceled (the first two with overt setups for new seasons in place), that leaves just The Punisher’s second season and Jessica Jones’ upcoming third to wrap up the Marvel Netflix universe. And given the pattern that’s been established, those will almost certainly be the final outings for Frank Castle and Jessica Jones, respectively. The Punisher’s first season ended on such a pitch perfect note of hard-won optimism that it’s hard for me to imagine it won’t be frustrating to watch the series un-retire Frank before, presumably, retiring him forever. On the other hand, Jon Bernthal’s take on the Frank Castle is so incredibly compelling that I can’t begrudge the chance to spend more time with him. In other words: I’m not entirely sure this season needs to exist, but I’m still looking forward to watching it anyway. “Roadhouse Blues” largely echoes the season one premiere, which was another episode about Frank briefly trying to start a normal life before finding himself sucked back into vigilante violence. (That episode felt even more rushed because it had to wrap up some Daredevil season two threads and have Frank retire in the first place.) But though the overarching idea is the same, “Roadhouse Blues” demonstrates just how much Frank really did change over the course of the past season (and potentially in some between-season group therapy sessions, although I’m not entirely sure how much time has passed). At the start of season one, the best “normal” life Frank could imagine from himself was one of isolation and non-stop manual labor as the only way to (barely) manage his agonizing grief for his dead family. The Frank we meet at the start of “Roadhouse Blues” is still a wandering lost soul, but it’s clear that he’s found a sense of inner peace too. The episode’s bloody opening prologue warns us that “Roadhouse Blues” isn’t just going to be a rom-com about Frank Castle finding love in small-town Michigan, but, damn, I kind of wish it were. Bernthal has always been utterly fantastic at finding the warmth and fundamental decency beneath Frank’s intimidating demeanor. And he’s even more charming as this more relaxed, contented version of Frank. The murder of Frank’s family is a trauma he’ll never entirely leave behind, but he’s clearly in a much healthier place than he once was. He carries his wife’s wedding ring around on a necklace as a tribute to his past, but he’s also open to the idea of making new romantic connections too. Whereas he was once defined by tight-lipped secrecy, he feels compelled to open up to his bartender paramour Beth (Alexa Davalos) about his family and his past. Davalos makes an absolutely fantastic scene partner for Bernthal, one who feels both like an equal and like a counterbalance. Alas, Frank’s rom-com has to come to an end, which it does with a massive bar brawl that sees him unleash his Punisher instincts once again. It’s not one of my all-time favorite Marvel Netflix fight scene. It feels too staged for the sort of brutal, scrappy brawl it’s supposed to be, but not staged enough to be a compellingly fluid action sequence. It’s also lacking in internal logic at times. For instance, I’m not sure why the baddies are so adamant about using knives instead of guns, especially once Frank turns out to be a far more formidable enemy than they were expecting. Thankfully, the car-chase-turned-shootout is a much more effective action beat. Structurally, “Roadhouse Blues” is smart about setting up some larger narrative propulsion around its edges so that it doesn’t just feel like small town rom-com wheel spinning followed by a big fight. We don’t know much about what kind of trouble Giorgia Whigham’s as-yet-unnamed teen is in, but the episode does a good job weaving her into the story and raising our interest without wasting too much time on vague mystery. 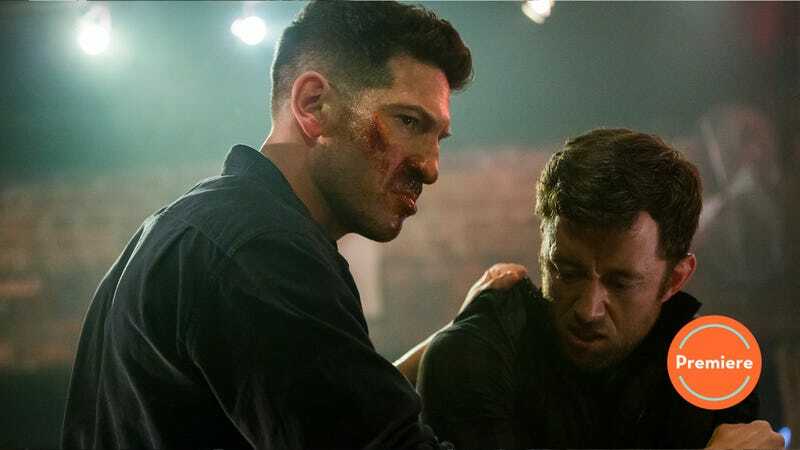 The Punisher is always at its strongest when it’s exploring Frank Castle as a father figure (we get some really charming stuff in this episode between Frank and Beth’s son Rex), and though it pains me to see Frank give up the life of Michigan normalcy that might’ve been, putting him on the run with a teenager actually feels like a really great hook on which to build the season. My optimism about this season very much hinged on whether this episode was going to lazily kill off Beth to give Frank some more angst. That she ends up injured but alive is a good sign in my book. Question for the group: Do any of you actually say “go to the market” instead of “go to the grocery store” or is that just a TV thing? I don’t think I’ve ever heard it used in real life, but I’m wondering if it’s a regionalism. Love that successful LA-based, Tennessee-born country singer Shooter Jennings apparently has a thriving career performing in the 2,000-person town of Bart, Michigan. The shot of Billy opening his eyes in his Jigsaw mask looked really cool. It’s almost unnerving to spend so much time with non-bloody, smiling Frank in this episode. If they did make a Frank/Beth rom-com, it would definitely be called One Beer At A Time.